This class creates a custom drawable object (derived from ILGroup) which holds a number of points for rendering. The resulting object is special, because its type will be populated to the synchronized tree. Instead of the common base types (ILGroup), this class adds all overloads which are necessary in order to find the actual type (ColormappedPoints) in the synchronized render tree at runtime. The type can be supplied with any logic which is executed at runtime in this synchronized version only. This is interesting in order to give the object an individual interactive behavior, as one example. 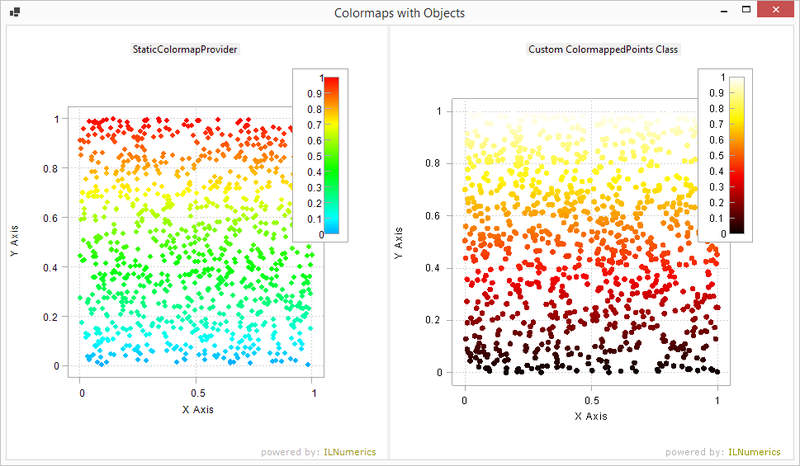 Here the object provides all needed data to the colorbar, hence serves as a genue ILColormapDataProvider. (This is for demonstration purpose only! Use the ILColorbar.ColormapProvider property to assign a (much simpler) static colormap provider object!) However, you may take this class as a starting point for own scene graph object class implementations.